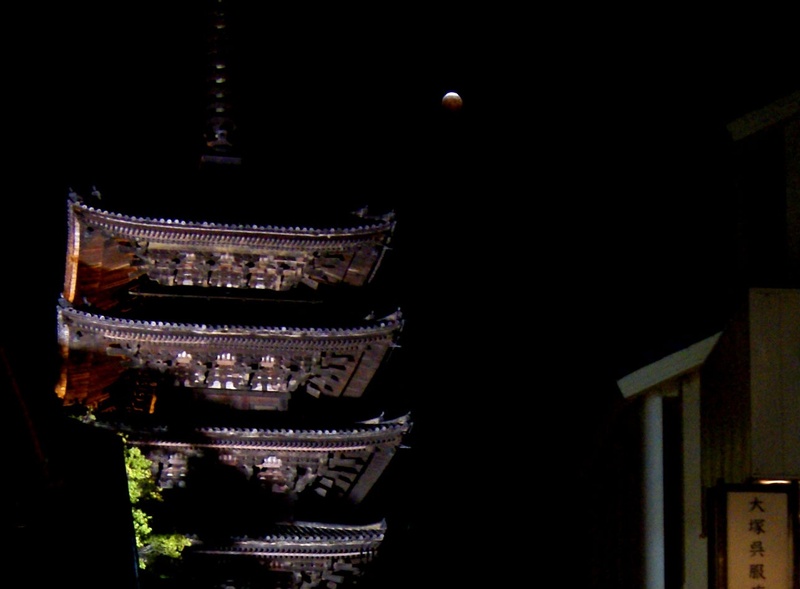 The Blood Moon above Kyoto. 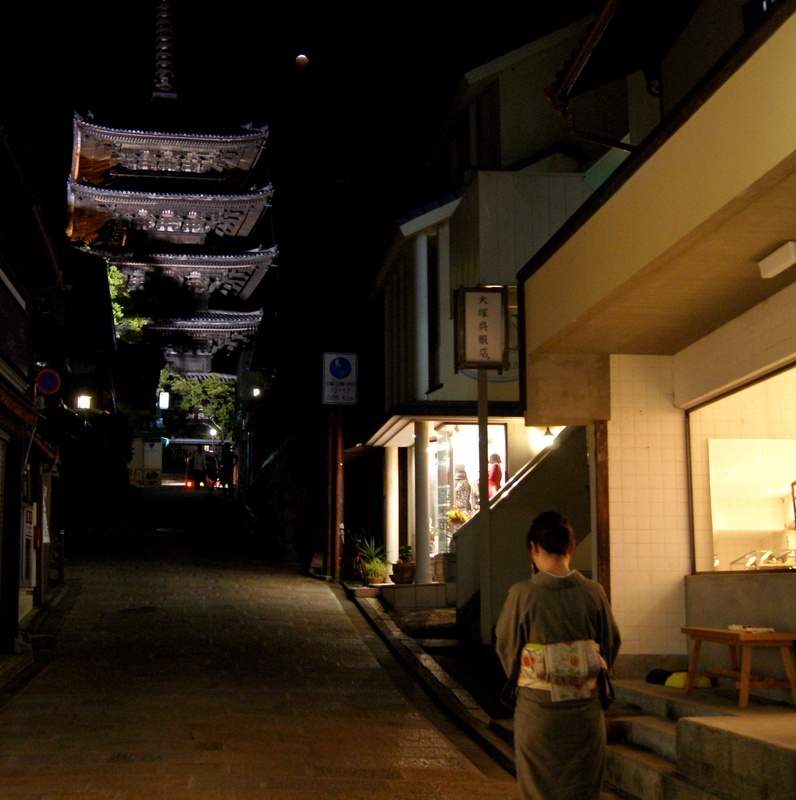 Oh Kyoto Higashiyama how pretty you really are! I know, a complete contradiction from my last post. Once you walk out of the downtown area which is a ordinary mishmash of uninviting apartment buildings and nondescript office blocks then photogenic Kyoto reveals it’s most refined self. A range of green hills appear, neighbourhoods are labyrinths of winding whispering alleyways walled by old timbered houses, shadows kneel behind sliding wooden doors that try to enclose clipped string music and thoughtful laughter, wooden geta sandals click against stone moss pathways, through delicate manicured gardens and around dancing fountains, hanging snake like tree branches falling into rushing streams their flower petals a silent riot of color, street posters of the Kyoto stars of our era the Geisha advertising earthly vices, strange deserted temples with bronze pigs on altars of painted eggs, granite noble fox statues dressed in red cloth while paper lanterns sway in the breeze, the zigzag of orange the koi and their black eyes peering from murky watery worlds. The ancient Japan that you imagine. It seems that every branch and every twig on every tree has been twisted and straightened over centuries to reach this zenith of perfection. Higashiyama, the hilly neighbourhood has some of the most enchanting and encaptivating streets I have ever had the honour to walk along. We decided to walk through the famous entertainment hanamachi of Gion trying to glimpse a Geisha but it was eerily quiet. 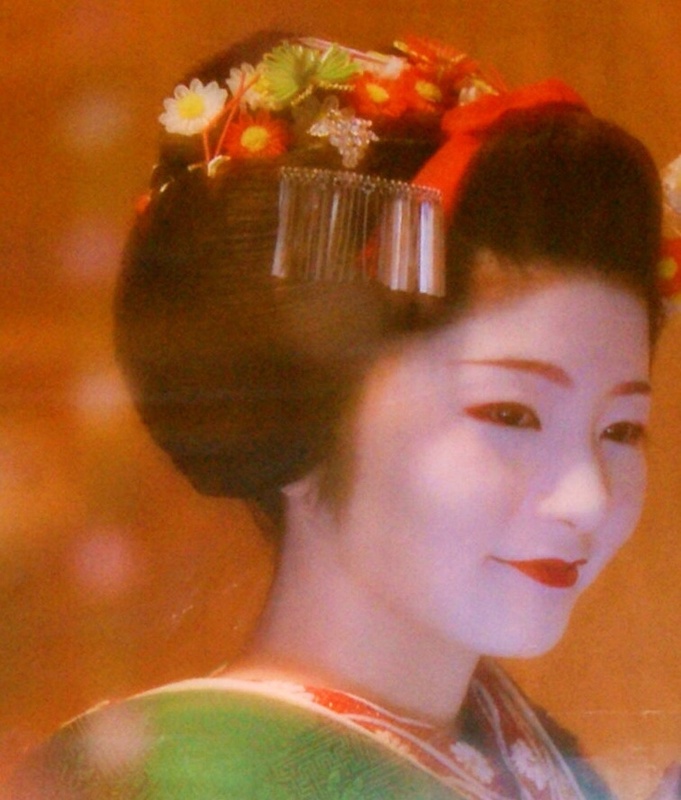 Geisha are very difficult to spot as their art form is in decline but I would have been happy with one of the fake Geisha that a secret organisation pay to walk around and let tourists photograph them. Little did we realise we were about to witness something far more incredible than geisha or falling cherry blossoms. 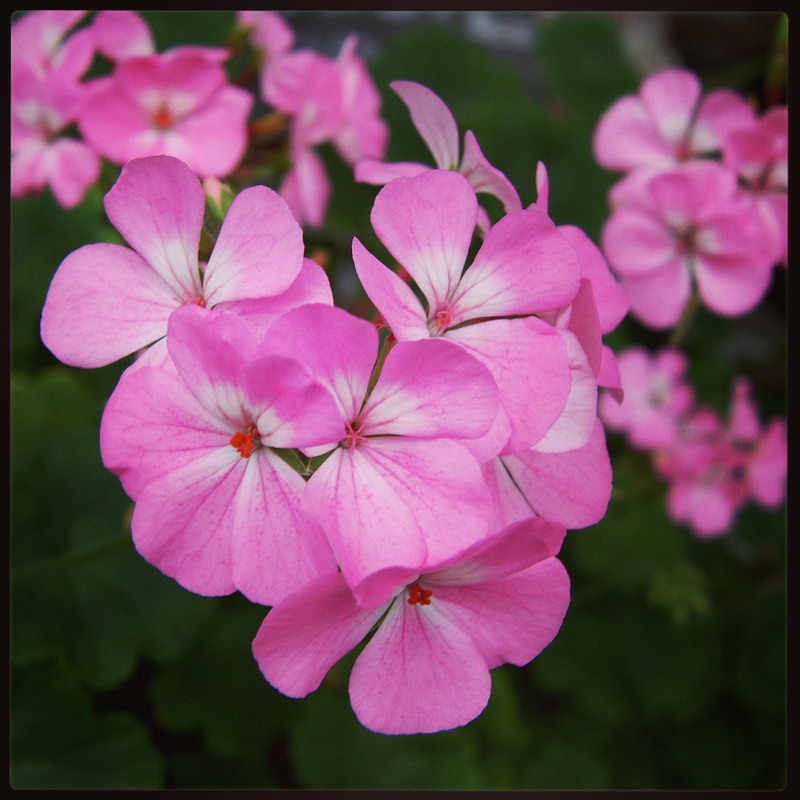 It happened while we were walking uphill, I didn’t realise what was going on but people were standing in doorways, cameras and phones clutched in their hands, some people were whispering, I even heard a frightened woman gasp which was very out of character for the Japanese. An old smartly dressed man came bowing over to us his quavering fingers pointed to the sky and in a heavy accent said “Look!”. It was at this moment I realised how lucky we were, we were not only witnessing a spectacular lunar eclipse but the Kyotoites themselves and their love for the natural world. By the time we had walked across Gion we were in the hills and standing under the incredibly majestic 15th Century Yasaka Pagoda, the ivory moon in the clear night had turned a martian red rust, known as a bad omen of things to come. No one was talking, just staring at the moon, it was almost as if you could hear a pin drop. I can’t ever remember seeing a lunar eclipse as beautiful as this one, it had something to do with the red hue of the moon, Asia, the architecture, and the way it had stopped the inhabitants of a city in their paths. What a welcome to Kyoto, something that will stay with me forever. This entry was posted in Japan and tagged Blood moon, Century Yasaka Pagoda, Geisha, Gion, Higashiyama, Japan, Kyoto, Kyoto Higashiyama, Lunar eclipse, Temples, Yasaka Pagoda. Bookmark the permalink. ← The Japanese Bullet Train. October 2014.